Just as Williamson and Johnston suggest, the time has come for school leaders to stop trying to find ways to block and ban social media and embrace it as both an educational tool and a fact of life. It is time to overcome the fear of all the bad things that might happen, roll up our sleeves and begin the work that will give the technology it’s rightful place in our schools. The problem of getting started though, is often seated in a lack of knowledge and understanding of social media and its potential in education. That’s where Ronald Willamson and J. Howard Johnston’s book, The School Leader’s Guide to Social Media can help. 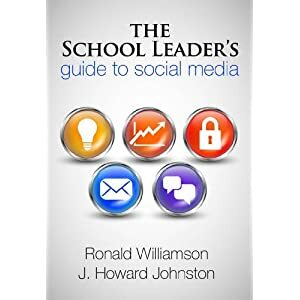 In this book, Williamson and Johnston provide a crash course on what social media technology is and how school leaders can step up and lead in tapping into its true potential as a educational tool. Loaded with tons of practical tips to help in the successful implementation of social media in teaching and learning, The School Leader’s Guide to Social Media is a comprehensive guide to using social media in education. It’s here to stay and it’s only getting bigger. Kids are using it to talk about you and your school. It’s the way kids communicate. It’s a new workplace and higher education communication standard. Mobile devices put a computer in nearly everyone’s hands. It has huge potential for school leadership. It’s a great way to engage kids in instruction. Communication is instantaneous and widespread. It’s beyond the control of the school, but it can be used well in school. Schools can model and and help kids learn responsible use of social media. In addition to providing a clear rationale for social media’s place in the school, Williamson and Johnston also provide a description of social media, its educational potential, an overview of the potential pitfalls of social media, and clear ideas to proactively address these pitfalls through solid acceptable use policies. In later chapters, the authors review the most commonly used social media tools and provide many, many ideas on how to engage the technology as a learning tool for both students and teaching professionals. They also give specific suggestions on how school leaders can engage in the use of these same tools in their administrative roles. The School Leader’s Guide to Social Media is an excellent resource for the school leader who has not yet bought into its potential as an educational tool, but needs more than a how-to-set-up-a-twitter-account approach. It is a book about the integration and engagement of social media. It is a book that definitely will end up with some pages dog-eared for future reference. For me personally, the only negative with The School Leaders Guide to Social Media is that there is currently no eBook version for my Kindle yet. However, the publisher does offer a DRM Free version of the book at the Eye on Education Publisher's Website.